The Brothers that just do Gutters Seattle, WA is set to launch August 1st, and is owned and operated by father and son team, Shaun and Rex Borden. With a large amount of rainfall per year, Seattle Washington and the surrounding neighborhoods need a reputable gutter contractor to help protect these beautiful Seattle homes! Your home’s gutter system is its first line of defense against water damage, designed to channel water away from your home and its foundation. You can feel confident when hiring any Brothers Gutters team as your gutter installer, that your gutters will be installed correctly, with top-of-the-line material, and you will receive excellent customer service. Shaun and Rex have been working together in business for over 6 years. Shaun has been married for 38 years, and Rex is his only son. He has decades of business experience under his belt in the service and manufacturing industries with concentration in the area of finance. Rex, Shaun’s son and business partner, has years of experience in management roles in insurance and staffing industries. Shaun loves working with his son Rex and is very excited for their next step together as Brothers Gutters franchise owners. “Working with my son is probably the greatest experience that I think a father could have. It’s just a wonderful privilege,” Shaun said. Shaun and Rex have different talents that are complimentary, which makes them a successful business team. 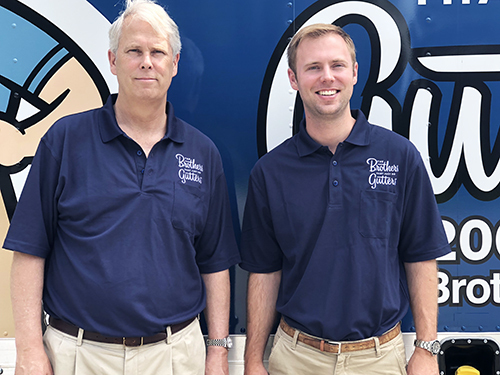 One of the reasons why Rex and Shaun were so excited about becoming Brothers Gutters owners is because we are a company founded on family principles, and Shaun and Rex are excited to be able to continue the Brothers Gutters family business tradition as the first father and son Brothers Gutters team. 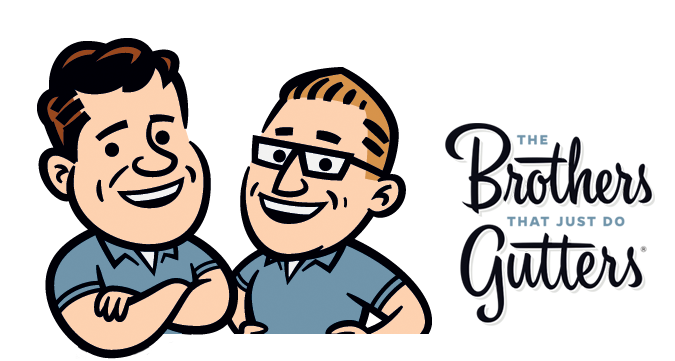 Shaun (left) & Rex (right) Borden – Brothers Gutters Seattle, WA Franchise Owners. Rex and Shaun decided that a franchise was the right move for them because with a franchise model the brand and processes are already established. “We don’t have to reinvent the wheel and The Brothers that just do Gutters have a wonderful call center and a wonderful back office staff to be able to take a lot of the pressure off,” said Rex, “The behind the scenes work that makes all of this possible has been delegated out so that we just need to make sure that we have quality production and quality sales. A lot of the back-office admin roles are taken care of by the franchise.” This is not something that a lot of franchise systems offer, and this is one of the top reasons why Shaun and Rex chose to purchase a Brothers Gutters Franchise. While in NY for training, Shaun and Rex were able to really get a feel for our culture in our corporate office that we communicate franchise wide, as well as how day-to-day operations work. “The corporate office is absolutely amazing and the culture they have created is incomparable,” said Rex. Shaun was also impressed by the Brothers Gutters culture saying that he really appreciates the culture and attitude demonstrated franchise wide. “It’s a culture of can do, and it’s a culture of helping,” he said. Shaun and Rex want to continue our mission of “reinventing contractor service” by providing the best services in our niche industry. Homeowners are often disappointed with the home improvement service providers they hire, and The Brothers that just do Gutters have made it their mission to change that. Seattle, WA now has a reputable, trustworthy, reliable, and skilled gutter installer in their area! Brothers Gutters Seattle, WA is now serving your local community in Seattle and the surrounding areas!